Ann Hamilton’s work is primarily installation and site-based work which engages with the architecture of a particular site. Her works combine sound, text, video, photography, books and large quantities of collected materials such as used clothing. Her works are often time-based and process orientated. 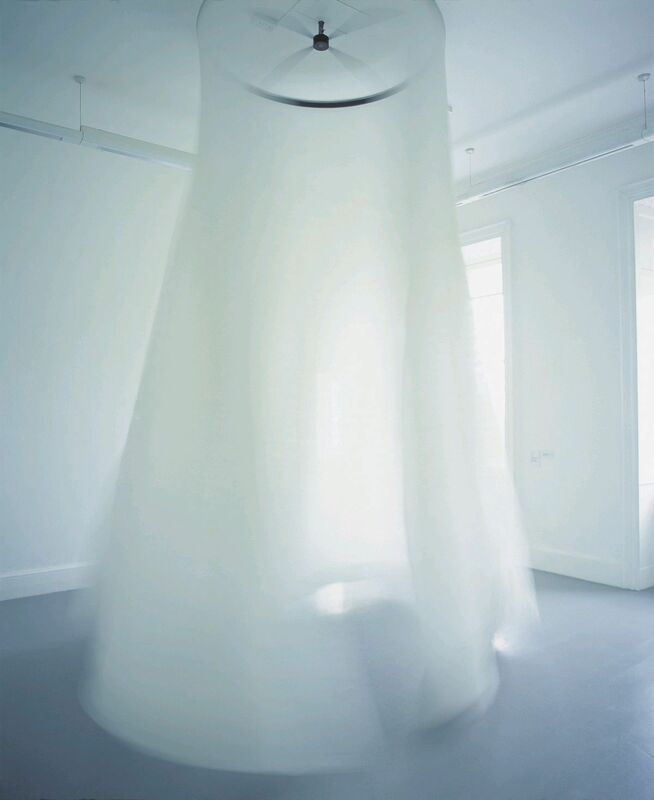 In ‘Filament II’ a silk organza curtain, which has been distressed by the artist, is installed hanging from a motorised circular rail in the centre of a square room. It is a sculpture with blurred boundaries and mutable volume and form, creating at once a public and private space. The spinning curtain envelopes you but is transparent, so a shadowy silhouette is still visible to others standing outside. The presence or absence of people change perceptions and experience of the work, and in this regard it is interactive and participatory. Hamilton has said of her installations: ‘These are all situations which implicate you as an active participant’.